Click to see who's who! Secondly - Hope to see you this weekend for our print party! 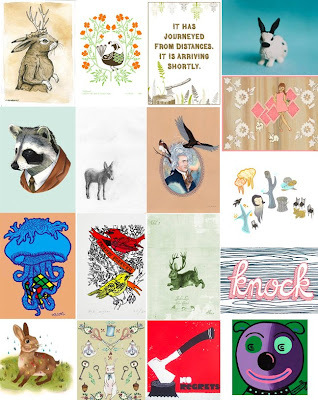 Here's a selection from some of the participating artists who where kind enough to grace this little gallery with their brilliant and charming work! We said we'd be selling these prints online for those of you who cant get to Brooklyn... and we will. But you'll have to wait until next week! Starting Monday we'll have the prints that are still available for sale online. Keep your eyes peeled!